In 2019, I will be hosting at least one scheduled summer workshop as well as what I will be calling a flex workshop. 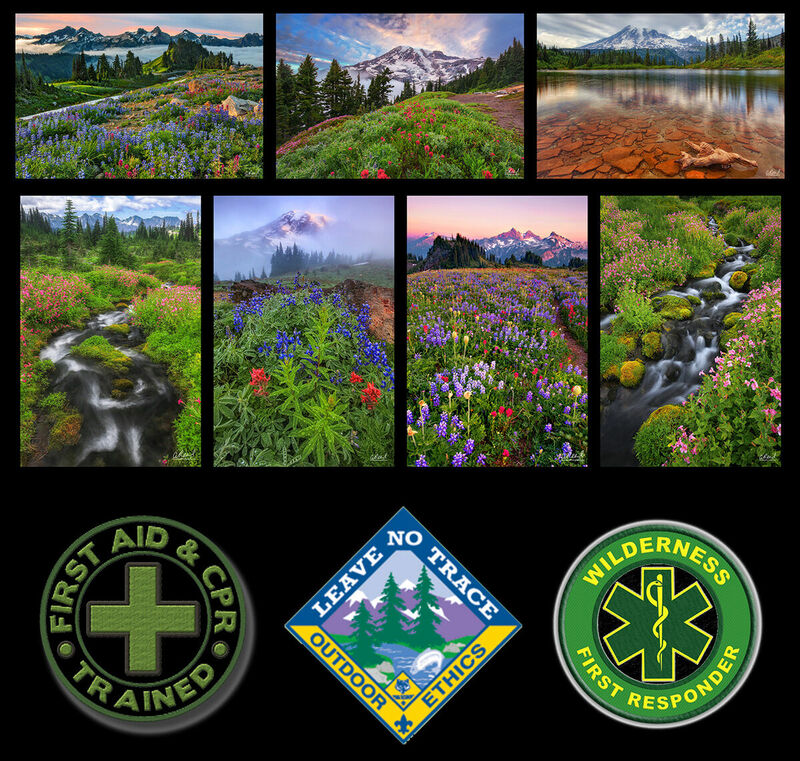 For those who need time to plan and hope to visit Rainier during the peak wildflower season, I will be holding a 3 day workshop in mid-August. For those who have a greater degree in flexibility, I will be offering a 5 day FLEX workshop. This workshop will be held at the peak of the wildflower season no matter when it happens. Those who have signed up for this workshop will be contacted by me as soon as the first hints of the wildflower season begin and we will finalize the dates of the workshop at that time. This flexibility and very limited attendance will guarantee you the opportunity to photograph one of the most amazing national parks the US has to offer at the absolute height of the season and will provide you a greater opportunity to receive truly personal instruction, portfolio review and post processing lessons than any of the other workshops that I offer. Please continue reading below for the details of each of these incredible opportunities. Mount Rainier National Park is a United States National Park located in southeast Pierce County and northeast Lewis County in Washington state. It was established on March 2, 1899 as the fifth national park in the United States. The park encompasses 236,381 acres (369.35 sq mi; 956.60 km2) including all of Mount Rainier, a 14,411-foot (4,392 m) stratovolcano. The mountain rises abruptly from the surrounding land with elevations in the park ranging from 1,600 feet to over 14,000 feet (490 - 4,300 m). The highest point in the Cascade Range, around it are valleys, waterfalls, sub-alpinemeadows, old-growth forest and more than 25 glaciers. The volcano is often shrouded in clouds that dump enormous amounts of rain and snow on the peak every year. This scheduled 3 day in the field workshop will be held the second week in August based on my years of experience photographing the park during the wildflower season. Even in less than monumental years or when the season comes earlier than expected, there is still an astounding amount of breathtaking photographic opportunities in the park during this time including spectacular views of the mountain at every turn, waterfalls, old growth forests, rivers, streams and lakes. If you do not have the opportunity to register for my flex workshop described below, but still want your very best chance at seeing the incredible display of wildflowers in the park, this is it! We will be meeting at paradise lodge the morning of the 10th, to begin a short hike just before dawn and the workshop will conclude just after sunset on August 12th. The closest major airport to Mount Rainier National Park is the Seattle Tacoma International Airport(SEA). This airport is in Seattle, Washington and is approx 80 miles from the Nisqually entrance to Rainier National Park. Transportation to and from the park, hotel accommodations, entrance fees and travel during the workshop are not included in the registration fee for this workshop. Those interested can email me directly for my food/lodging and travel recommendations. Once registered, you will receive a greater detail of information about the workshop, the places we will be visiting, the expected conditions and all of my gear recommendations specifically tailored to this workshop. Light to Moderate hiking on uneven surfaces will be required and some hiking may be considered strenuous for short periods of time and by those less experienced. We will not be going on any extreme or back country hikes on this workshop. This workshop is limited to 6 people and is expected to be one of my most popular of 2019. I have been asked to conduct this workshop for many years. If you are interested, I suggest you do not delay in signing up. To register, a 50% deposit is required with the remaining 50% due on or before June 17th, 2019.